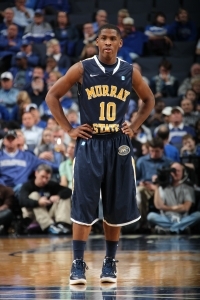 Zay Jackson, a sophomore point guard for Murray State tore his ACL this past weekend and will miss the entire 2013-14 season. Jackson averaged 4.9 points and 2.1 rebounds as a freshman two years ago. He was suspended last season and missed the entire year. “Zay will be out for the season," head coach Steve Prohm said. "He’ll have surgery in a couple of weeks on his ACL. We’ll repair it and he’ll start rehabbing it and we’ll get him back and get him healthy. He’s got good plans ahead. I’m going to continue to encourage him in that because he has a bright future. I know he’s been through a lot of trials and tribulations with the situation last year, his Father recently passed away and now this. I love Zay and we’ll support him. Jackson was expected to be the starter at point guard. It appears that role will now fall to freshman Cameron Payne. Jackson's injury leaves the Racers without much depth at guard for the first nine games of the season. Payne, Dexter Fields and Jeffery Moss will probably start. But the only other true guards are C. J. Ford. and walk-on Jeff Martin. Moss averaged 4.4 points as a freshman last year while Fields started and averaged 6.5 points. Ford played sparingly and averaged 1.3 points. Clemson transfer T. J. Sapp will be eligible after the first semester is over and could challenge for a spot in the starting lineup. With just one starter back from last season the Racers will have their work cut out for them.